Lightweight, portable and economical, the Roll-n-Go PWC roller ramp shore dock makes getting on and off the water part of the fun! 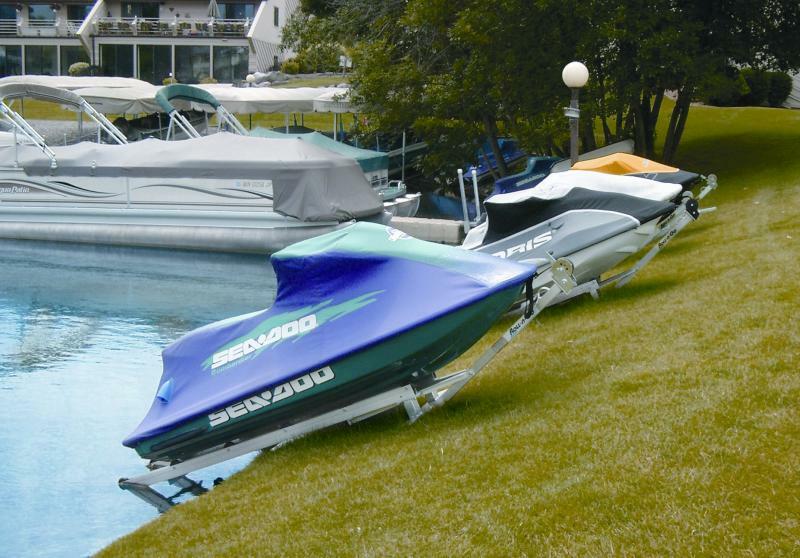 Now you can easily and inexpensively dock and secure your PWC out of the water right on your shoreline. This is Roll-n-Go's most popular and most portable model. Adjustable rail spacing will handle any PWC, including all 3-person models. To use, simply glide your PWC into the Roll-n-Go roller ramp shore dock and crank it up to easily get off the water in just seconds without scratching your watercraft's hull. 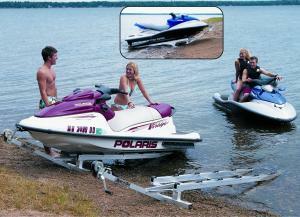 Fueling, cleaning and covering of your PWC are all easier with a Roll-n- Go PWC shore dock system.. The 25 foot winch strap includes a nylon loop on the hook to prevent scratching PWC hardware and hull. Security tie down loop to allow locking of your PWC. MAX. WEIGHT CAPACITY 1,000 lbs.